The Finger Lakes Region is a big kettle of nationalities. On any weekend, you can find a Greek, Polish, Scottish, Swedish, German or Italian Festival somewhere in the Finger Lakes. Some nationalities are more dominate today while others have melted into the background. One conspicuous group throughout the Finger Lakes is the Italians. Across the USA, 11.3% of the population can say they are truly Italians. The rest of us just wish we were! More Italians have migrated to the USA than any other European nation. In the Finger Lakes, some came for jobs, perhaps with the Erie Canal or at one of the many mill factories, and a chance to live a better life. Italian-Americans observe Columbus Day as a celebration of their heritage, the first occasion being in New York City on October 12, 1866. Columbus Day was first enshrined as a legal holiday in the United States through the lobbying of Angelo Noce, a first generation Italian, in Denver. The first statewide Columbus Day holiday was proclaimed by Colorado governor Jesse F. McDonald in 1905, and it was made a statutory holiday in 1907. In April 1934, as a result of lobbying by the Knights of Columbus, Congress and President Franklin Delano Roosevelt made October 12 a federal holiday under the name Columbus Day. Today the second Monday in October, coincidentally the same day as Thanksgiving in neighboring Canada, is Columbus Day. 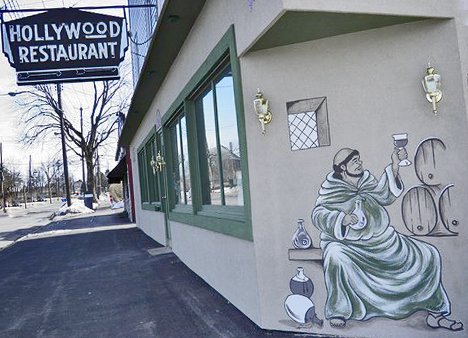 On a recent Thursday night in early celebration of Columbus Day, my daughter and I decided to dine at The Hollywood Restaurant, Clark Street, Auburn. 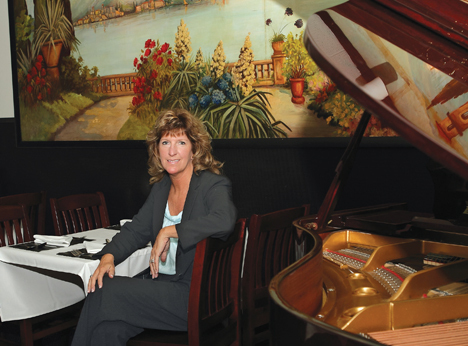 It has been serving happy customers for over 80 years and specializes in fine Italian and American cuisine. There were several tasty sounding specials, but we were drawn to the regular menu and selected two dishes - Home-made Ravioli and the Italian Sampler with an assortment of lasagna, meatballs, sausage, ravioli and spaghetti with red sauce. I knew there would be left-over and there were. These came with bread and a salad. I particularly enjoyed the Tomato & Onion House Dressing with bleu cheese. A simple tossed salad was dressed in brilliant red which was sweet and savory. I could have that dressing every night. Both of our entrees came hot and covered in sauce and melted cheese. Gooey and good for sure. We were too full for any dessert though our waitress offered to wrap it up “for later”. It would be impossible to list all the Italian restaurants in Auburn – but here is a try. There is Balloon’s which is in the shadow of the Auburn prison, Lasca’s which has a busy take-out business as well and Michael’s which is right next door to the Hollywood and has a player piano. There are certainly other spots which serve Italian along with other specialties. At Michaels, imagine the place that you would think Tony Soprano would frequent and this is that place! And I mean that in a good way! Be sure to try their greens and beans! Best of all, Duffy, the owner and chef, usually comes out to speak with guests each evening. He loves his restaurant and takes pride in everything that comes out of his kitchen. For an added treat, check out the St. Mary’s Pasta Dinner on the second Tuesday night of the every month. A long time fundraiser for the church cooks and servers are parishioners and they really know their business! It is pay at the door; Adults are $7 and children are $5. Tables are set and ready for the hungry. There is no waiting, but you will not feel rushed. You may sit next to someone you know or maybe not. Food is the great equalizer. A tossed salad with bread is followed by spaghetti with sauce and meatballs which is then capped off by a brownie & ice cream. What a great way to celebrate Columbus Day in the Finger Lakes!